Hand made recycled glass made using water based paint. 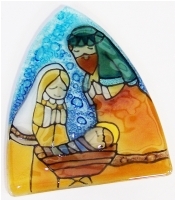 This ornament/ sun catcher is a great addition to your christmas tree, glass window, as well as your garden. All items are individually done. Thank you for supporting us.